Next to me cribs have become super popular in the last few years as parents try to find the safest and easiest way of creating a strong bond with their newborn. 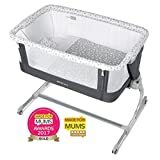 The best next 3 me cribs give the mother or father easy access to their baby when they wake during the night for a feed, change or a cuddle whilst also providing them with their own cot to sleep in. Co-sleeping with your baby in the bed with you is not recommended, however, a bedside crib that has a drop side and can be attached to your bed gives you some of the safe benefits of co-sleeping without any of the risks. The rounded and cocooning shape of the Chicco Next2Me Crib makes it the perfect sleeping space for your newborn child. 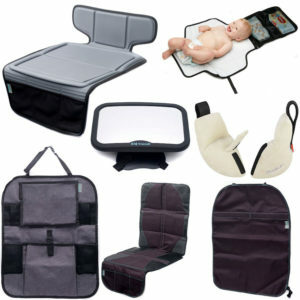 Padded sides eliminate any hard surfaces that might hurt or cause your baby to be uncomfortable. Two secure fastening straps let you keep your baby near you while allowing them their individual space. With this comfortable crib, your little one can sleep through the night and afford you some quality sleep as well. Six height positions keep the Chicco Next2Me Crib at the same level as your bed to provide you greater access to your little one. This lets you reach out to cuddle, comfort or even lull them to sleep without straining your body. In case your baby is suffering from a cold or reflux, you can incline the crib to help ease the congestion. The foldable feet on the crib eliminates any space between you and the baby for added safety and comfort. 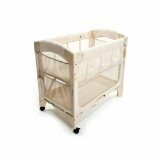 The simple yet secure fastening mechanism makes it easy to attach and detach the crib to the bed. Weighing only 8 kg, the Chicco Next2Me Crib ranks in the best travel crib market, and it comes complete with a practical travel bag. 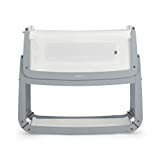 It is a great purchase if your baby has trouble falling asleep in a new environment as you can take it with you when going on holiday or visiting family. The Chicco Next2Me Crib progressively grows with your baby to transform into a standard crib when you want to move them into their own room. The crib measures 69 x 93 x 81 cm when unfolded and 68 x 94 x 17 cm when folded. Elegant and stylish, the SnuzPod Bedside Crib the let you keep your baby in easy reach while affording them a private sleeping space. 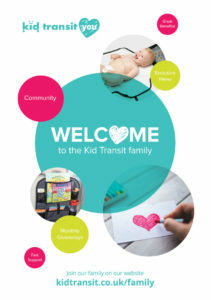 It boasts a handy 3-in-1 design to meet all your parenting needs with great ease. It comprises a bassinet, co-sleeping cot, and a standalone cot. It makes the perfect baby product since it grows with your child, saving you the expense of buying different products as your baby grows. Nine height adjustable settings make it easy to attach the co-sleeper to any bed that you have in your bedroom. A drop-side lets you access your baby quickly when you need to breastfeed them, lull them to sleep, or even cuddle to create a strong bond. It saves you the trouble of having to get up in the middle of the night to feed your growing child. The new tilt function allows you to set the SnuzPod at an angle to help if your baby has reflux or is suffering with a cold. Besides the aesthetic appeal, the award-winning SnuzPod Bedside Crib is designed with baby safety in mind. It emerged the number one Moses Basket or crib in 2015 and won the Platinum Junior design awards in 2016. The SnuzPod converts to a moveable bassinet so you can have your baby napping with you during the day. Each unit ships with a comfortable baby safe mattress to let your growing baby sleep in sheer comfort from birth until they are around six months old. A transparent mesh window lets you check on your baby without disturbing their sleep as well as providing a breathable environment. The sturdy beech wood construction is free from harmful chemicals. The co-sleeping cot measures 100 x 42 x 95 cm to fit a standard baby mattress. SnuzPod 3 has added functionality, a lighter bassinet and a more breathable sleeping environment. More than just a bedside crib; use as a bedside crib, stand alone crib or moses basket/bassinet. 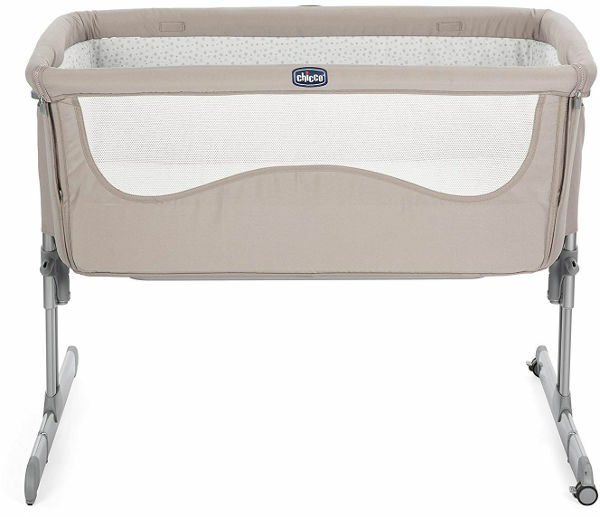 The Jane BabySide Crib is similar in design to the Chicco Next2Me co-sleeper. The standalone crib lets you keep your newborn baby right next to you without sharing the same bed. This adjustable crib fits onto your bed to create a safe and comfortable sleeping space for your baby. A simple and reliable fastening mechanism lets you attach the crib to the mattress and the bed frame so that you can all enjoy a peaceful nights sleep every night. 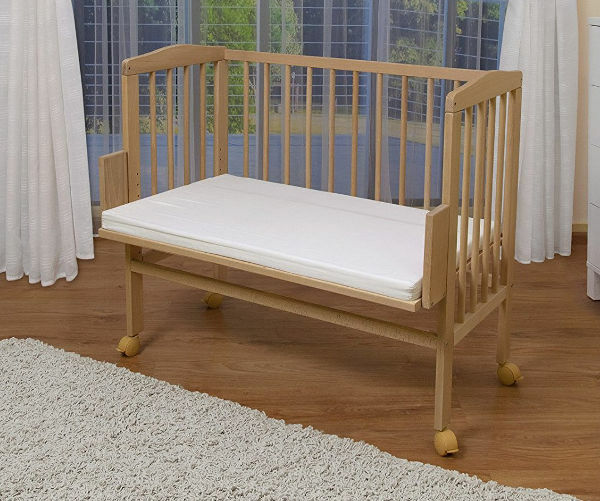 The crib boasts six different height settings so should fit any bed you have. This helps you to position the crib at the same level as your bed to let you reach the baby with greatest ease. The wheels and braking system on the crib makes it easy to move during the day. Retractable feet on the Jane Babyside crib lets it fit even on the lowest divan. Thanks to an adjustable drop-side, you can breastfeed and cuddle your little one without getting out of bed. It means that your baby is never out of reach while affording them a cosy personalised sleeping space. Moreover, you get to adjust and fold the drop-side noiselessly in a matter of seconds to pose the least amount of disturbance to your baby. The breathable mesh sides mean they are by your side as well as being safe in their own space. Each Jane Babyside crib ships complete with a 100% baby safe cotton bedding set. The set includes a zippable quilt with a cover, a baby pillow with pillowcase, and a fitted sheet as well as a baby safe mattress. All items are easy to remove for washing to help you keep your baby in a clean and sanitary space. Remember that pillows should only be used once your baby is over 12 months. The crib measures 68 x 92 x 68- 79 cm when unfolded and 68 x 94 x 17 when folded. The co-sleeping bassinet fits beds that are up to 24 inches off the floor to keep your baby within easy reach. You only have to reach over into the crib when you need to soothe or breastfeed your baby. This next to me crib minimises strain on your body to let you heal from a difficult labour without compromising the care of your newborn. If your bed is higher than the regular 24 inches, simply buy leg extensions, and you can have the baby on the same level as you. Two wheels on the Arm’s Reach Co-Sleeper Bassinet lets you keep the baby near you at all times. Simply lift the non-wheeled side of the crib, push it around the home, and create a strong bond with your growing child. At 11 kg, the bassinet is kind on your back and easy to reposition for daytime naps. In addition to being lightweight, the bassinet folds up and down quickly, making it an ideal travel cot for you and your baby. 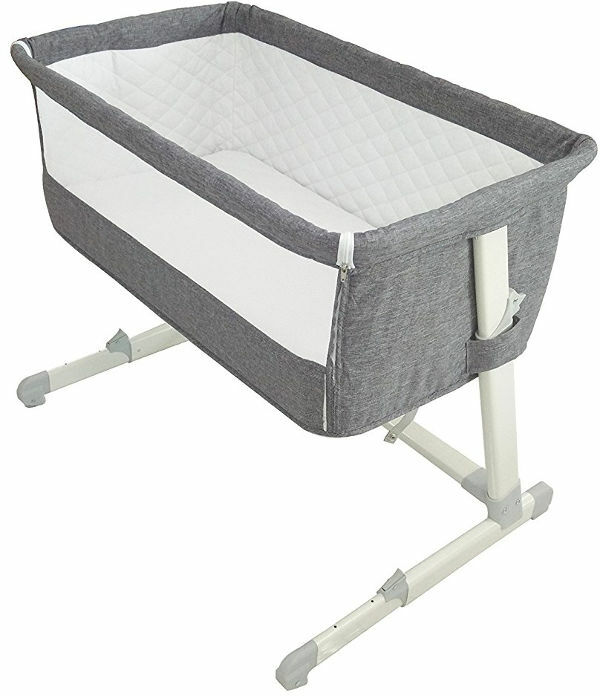 This bassinet is the perfect product for the new parent looking to keep their baby safe and well rested. To be used from birth to 6-8 months. The WALDIN Bedside Cot makes a stylish and comfortable way to keep your baby in the same room while giving them their own space. 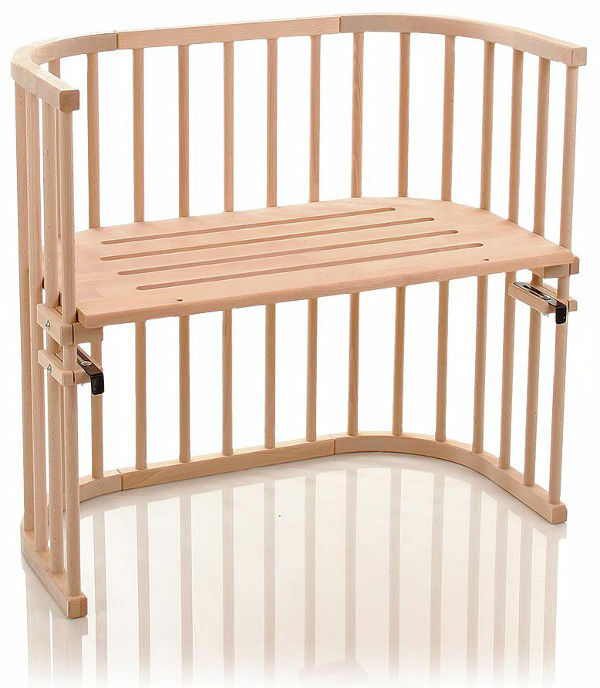 The solid beech wood construction will keep your baby safe and sound until they are ready to move. This handy product converts into a cot, cradle and a child’s sofa as your little one’s needs grow and change. The WALDIN Bedside Cot boasts four wheels, all fitted with a brake, for easy movement around the house. The co sleeper fits snugly next to your bed without leaving a gap in between the two. It makes for a seamless transition from your bed into a cot. This way you can be sure that your child is safe and sound at all times. A fixed albeit adjustable connection secures the cot to your bed while avoiding any movement whatsoever. 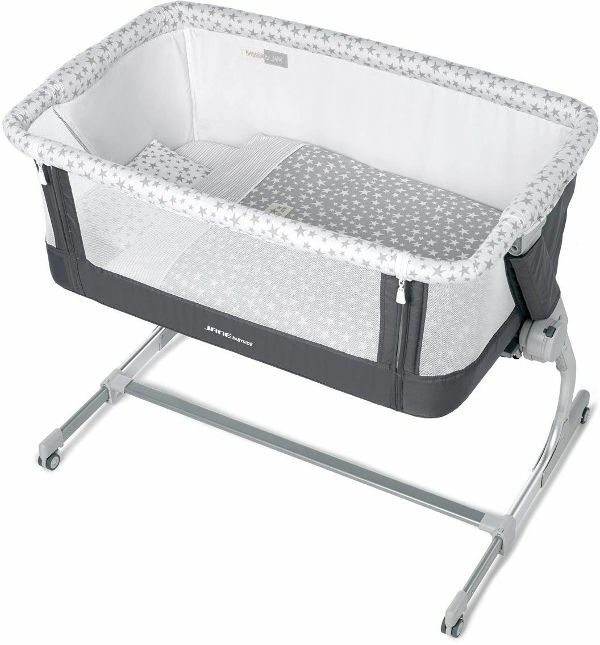 The 10 height adjustable settings on the crib lets you keep your baby at the same height as your bed. It makes it easy and convenient to reach over and hold, cuddle or breastfeed your baby in the middle of the night. No longer do you have to stumble in the dark when it’s time to feed your growing child. The co-sleeper keeps your baby right by your side during the crucial first six months of her life. Each cot ships with a 4 cm thick foam mattress that feels firm and gentle on your baby’s back to promote healthy development. A removable and washable 100% cotton mattress cover makes it easy to keep the cot clean and sanitary. The cot dimensions measure 95 x 60 x 45-80 cm to fit a divisible baby mattress measuring 90 x 40 cm and 90 x 55 cm. Babybay is a trusted brand when it comes to bedtime products for babies. The Babybay co sleeper is a height-adjustable crib that will make your nights with a newborn a lot easier. 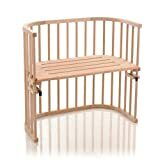 The crib comes in natural wood and looks elegant in any room setting. This crib can be adjusted up to a height of 100 cm high, making it convenient to attach to beds that are particularly high. It comes with patented clamps that attach to the side of the bed. The clamps adapt to divan as well as frame beds. Once attached to your bed, the Babybay is very secure so this should ease your mind knowing your baby’s safety is guaranteed. Assembling the crib is easy as there is an instruction manual to guide you. All the necessary parts are shipped with your package, including clamps, wingnuts, and Allen key. One of the best features of the Babybay is that it is very adaptable; it grows with your baby so it’ll save you a money in the long run. When your baby starts to outgrow his crib, you can adjust it to a bench seat until he’s 10 years old. When you need to use it as a standalone cot, simply attach the side rail to close it out and provide a safe space for your baby in which to sleep alone. The Babybay cot ships with a mattress for easy bed setup. The Mothercare Hyde Crib is the most affordable option on this list. No doubt it is your best bet if low price is the major decider for you. 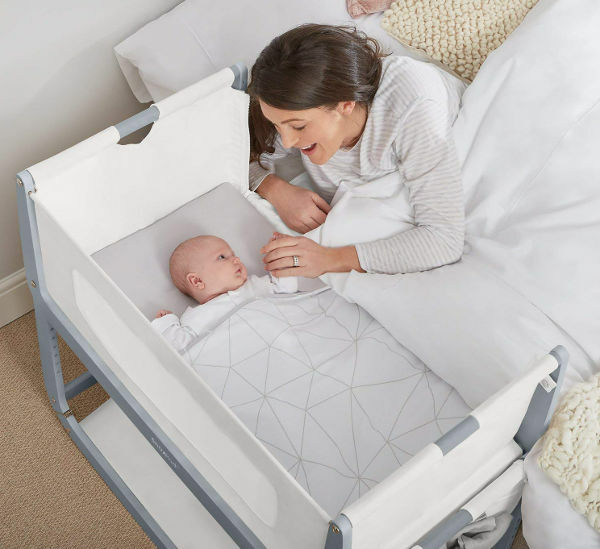 It isn’t a true co-sleeper as the sides cannot be removed, however it’s compact size makes it really easy to fit next to your bed and thus takes little effort to sit and reach over in the night to get to your baby. 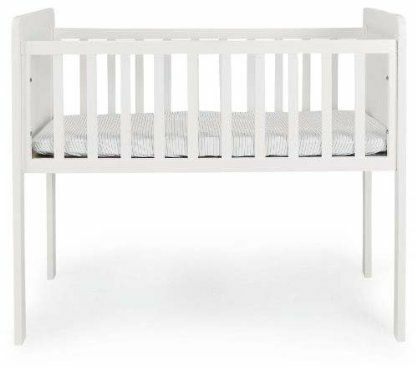 Featuring a classic design in snow white, the Mothercare Hyde crib has two closed ends. 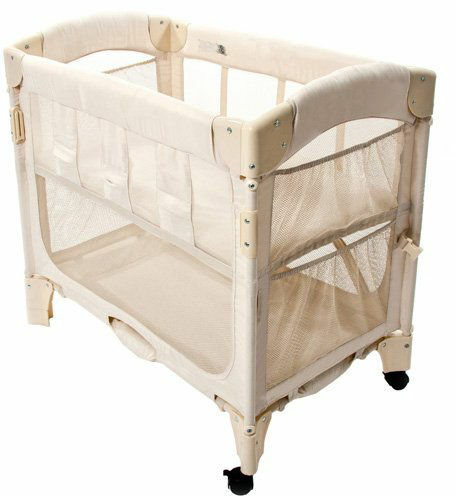 The cot fits together really easy and has a strong and sturdy design to give you peace of mind. If you only have a small room to fit your bed and your newborn’s cot into, then the Hyde will fit the bill. 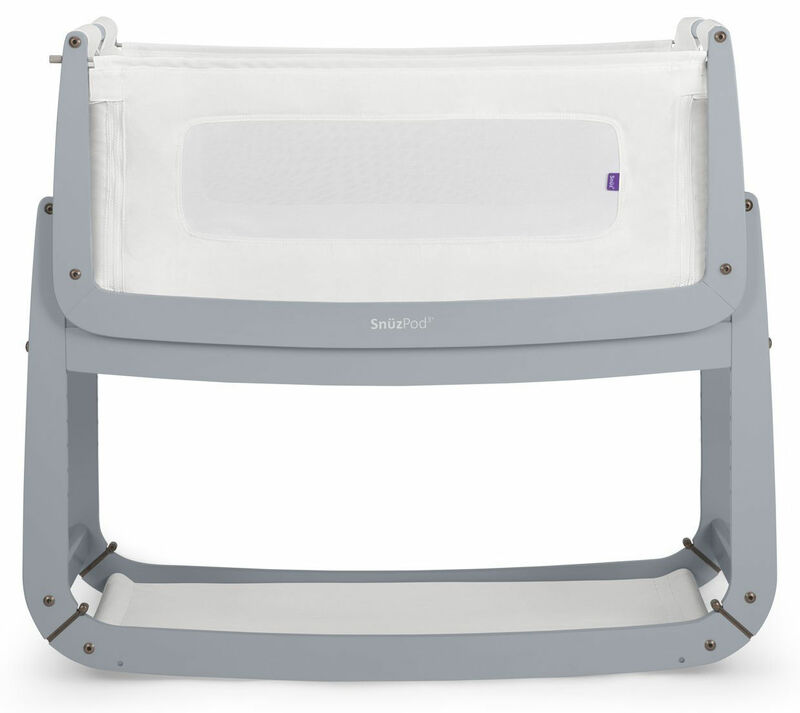 The Babylo Cozi Sleeper is a classic next 2 me crib with fabric sides, one of which can be unzipped so you can easily reach over to soothe or feed your baby throughout the night. The panel sides are made of soft quilted material so no chance of any bumps if your baby wriggles about. The crib can be set at five different heights depending on the height of your bed so you get a seamless fit between bed and sleeper crib. 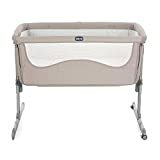 Also included with the cot is a firm but comfortable mattress and two fitted cotton sheets so you can keep the crib clean and fresh all day long. The lightweight (11 kg) crib can be easily moved from room to room so you can keep your baby with you when they are napping during the day. It also comes with a bag so you can quickly put the crib down and take it with you when you travel. Complete with 2 free sheets worth £25 pounds. removable lining for easy cleaning. storage bag included. There are a number of different choices if you want a next to me or co-sleeper crib. 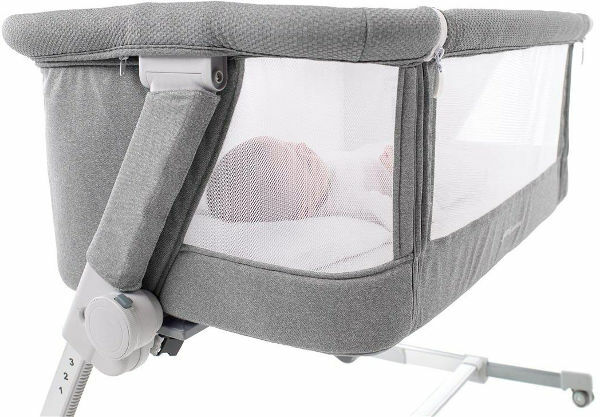 You can either get a metal frame and fabric cot (such as the Chicco Next2Me) which has a zip down side, a wooden co-sleeper with a removable side (like the WALDIN bedside cot) or one that is a combo of the two with a wooden frame alongside mesh sides like the SnuzPod. Each design has it advantages depending on the size of your room, how long you want to use the crib for and how portable you want it.